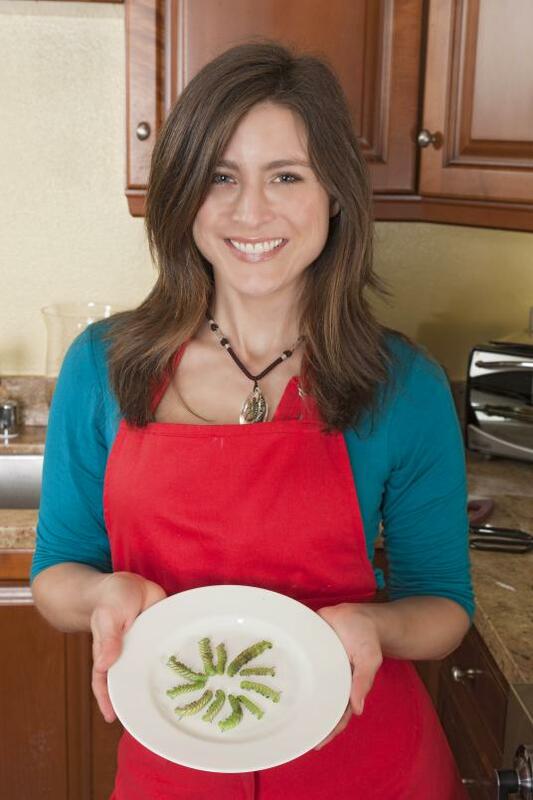 She is passionate about teaching people that insects are fabulous food –in addition to being the most environmentally-efficient animal protein source on the planet! Her dream is to increase public awareness and acceptance of edible insects, with the ultimate goals of helping to solve world hunger, support indigenous people, and reduce pesticide use with this cheap, eco-friendly source of protein. Daniella became fascinated with insect cuisine while conducting anthropological fieldwork in the Yucatan, Mexico. While living amongst the Maya and studying traditional indigenous food, medicine and culture, she learned that ancient peoples of this region used to supplement their diets with insects, partially because of the lack of large game. Intrigued, she began to research in earnest, and started her search for insects to try. To this date, she has eaten bees, crickets, cockroaches, fly pupae, wax worms, mealworms, silkworms, hornworms, bamboo worms, grasshoppers, walking sticks, katydids, scorpions, tailless whip scorpion, snails, stink bugs, tarantulas, cicadas, leaf-cutter ants, ant pupae, dung beetles, termites, wasps and wasp brood, butterfly caterpillars, dragonflies, and water bugs. So far, her favorites are wax worms, bees, wasps and fried bamboo worms. You are one forward-thinking (and very brave) woman! I am continually amazed at the possibilities for this idea and the guts that it takes for you to be the spokeswoman for eating bugs. I am glad you commented on my blog about my post. I am going to definitely keep an eye out for you and your show; which is great. Enjoyed the cooking demo today at the Natural History Museum – my son was particularly fond of the chocolate chirp cookies, but also liked the chutney and Cajun Crickets. You are the bee’s knees, ma’am. I hope your movement takes off…you are amazing. I am so glad I found your blog! Thanks for all the great info. I am all for trying new things, as I’m preparing to work the courage to try your Wax worm taco’s recipe. But WASPS!? Nooooo thank you. I was at the ISSN conference in Las Vegas this weekend and very much enjoyed your presentation. I think there could be a lot of potential in this area in terms of nutrition research and have no doubt that you will be able to find a University to sponsor your Masters degree. Good luck! Saw you mentioned in a New Yorker article. So fascinating! Good luck with the movement! Hey, saw a post about you on io9! 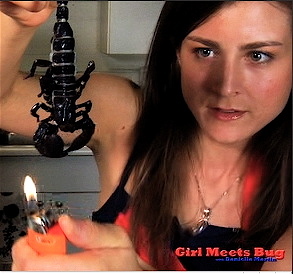 It’s funny, I was talking to a friend about cooking insects just the other day and she thought I was nuts, haha. What a fantastic website and program you put on! You are awesome. I can’t wait to start putting bugs on my menu. Thank you for all your great insight. Hi Michael, good idea. I’m working on it! Thanks! Yeah, I’m pretty much with you on the bigger arachnids – though I’d prefer people ate them than squished them. I want to thank you for your links to the suppliers and the amount of knowledge on these alternate food sources. You’re doing a great a service to the world by just informing more people to how these insects can be a nutritional powerhouse and pretty damn tasty. Seems we Westerners are a bit behind! I’ve tried some bugs before, but only as a novelty. It would be cool if they became a viable food source. Daniella, have you ever thought to purée bugs in a nutribullet, or other brand juicer that does not discard the pulp, along with fruits and veggies, to add protein to smoothies? Might help people get their heads around bugs as a plentiful, cheap, sustainable food source capable of addressing world hunger. My thinking is that if people didn’t have to see the bugs as they eat or feel the texture in their mouths, they might be willing to take that first step and begin consuming them in place of traditional livestock. It’s not a whole solution, in and of itself, but when combined with sprouts & microgreens, eating bugs could ensure plenty of food for all on this planet. With the ease of raising bugs at the home user level, it could also decentralize a large portion of our food supply, putting food production back into the hands of individuals. The health food crowd might be the group to slowly bring this into the mainstream in the US. Body builders might also be interested in bugs as a base for protein shakes, if those proteins are easily broken down and used by the body. Feel free to email me if you decide to respond. sounds fascinating! i’d like to know what’s a good “starter bug” to try eating. some of the worms sound difficult to stomach at first, but crispy shrimpy crickets sounds alright. not sure i could initially do roaches, either. Ewww gross! Just kidding! You’re a favorite at our house and although I’d have to be starving or at your dinner table before I’d eat most bugs, my husband and girls are willing to follow you into the creepy crawler unknown. Keep up the good work! Hey Daniella, I’m John. I’ve been in the military 12 years, I’m an avid outdoorsman/bushcrafter/hunter/etc. and I just willingly ate my first big (an ant) yesterday! I’ve studied about wilderness survival and self- Sufficiency. Which led me into wild edibles. Which started off plants and then I got to thinking what about protein? Bugs are easy food… I’m sure there will be many more bugs to be eaten. Thought I’d say I enjoy your website! Hi John, thanks! Not to toot the ol’ horn, but my book contains a guide to edible insects, one of the only ones I know of.